Learn about a few of the book scanners we offer. 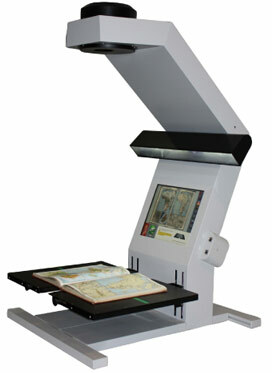 Have you thought about getting a book scanner for your office or school? Micro Records carries various styles of book scanners designed for easy digitization of books, files, contracts, and much more. Continue reading to learn more about a few of the many book scanners we offer! The ODS (overhead document and book scanner) is designed for walk-up users such as students, researchers, and staff members. This scanner is very simple and straightforward to use for those at every experience level, and the 8-mm wide-angle lens and LED lighting produce high-quality scans without any warm-up time. Use this scanner for flat documents, bound books, binders, photographs, and more! This scanner is great for offices that want to scan without unbinding or removing staples. The AF autofocus takes away the complication of trying to focus manually, and the scanner can even scan two pages at the same time. With two level built-in LED lighting and high definition camera, the cafe scanner is a great investment for under $5,000. We also offer walk-up public book scanners, including the Book2net Spirit, Zeutschel Zeta, and Book2net Kiosk II Public. The book2net Spirit is the very first entry-level high-resolution book scanner and is designed for replacing photocopiers in public, government, or corporate libraries. These scanners don’t require the paper, toner, and maintenance that photocopiers need, so they are extremely cost-effective. The Zeutschel Zeta is the perfect addition to an updated office, library, school, and more as it can digitize and copy almost any document you may need. The best part about the zeta is that it is incredibly easy to operate, as you simply switch it on and get started. The Book2net Kiosk II Public is very fast and precise with high durability and reliability. The innovative matrix-sensor technology surprises users with its high-quality and high productivity. Book2net Flash AI is a large format book scanner is a high-performance device specifically designed for the use in mass digitization projects with large-format originals. The motorized glass plate offers a very gentle treatment to preserve delicate originals. This is just a few of the book scanners we offer at Micro Records, learn more about all of the book scanners we offer here! Due to our company’s outstanding 2017 sales, Digitech Systems has selected Micro Records Company as A 2018 Gold Star Partner! Micro Records can help your business transition to a paperless way of life with quality e-forms and technology. For more information about how we can help your business utilize proactive monitoring, transition to doing things digitally, get rid of sensitive documents securely or benefit from new technology solutions, visit us online or give us a call at (877) 410-SCAN. For more tips on transitioning your business to paperless technology and going green, follow us on Facebook, Twitter, LinkedIn, YouTube, and Flickr. This entry was posted on Thursday, March 21st, 2019 at 4:37 pm. Both comments and pings are currently closed.